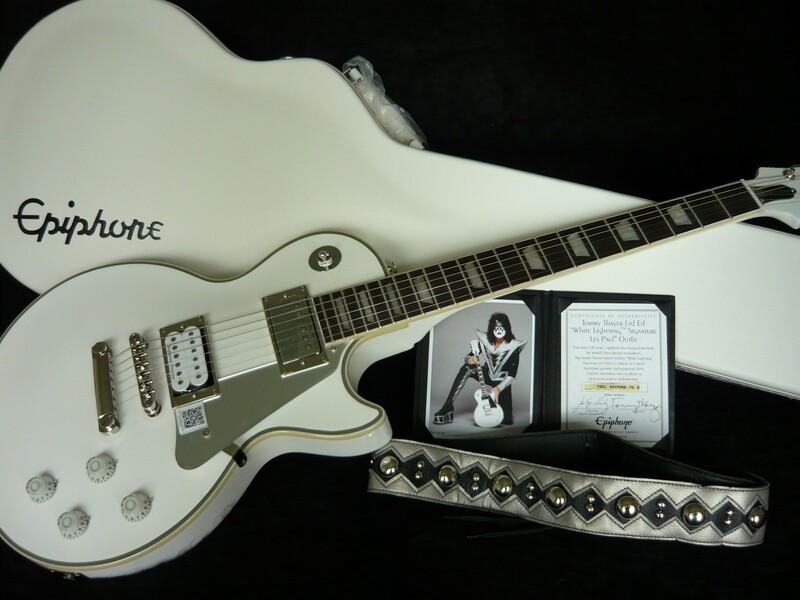 Brand new 2015 Epiphone Limited Edition "KISS" Tommy Thayer "White Lightning" - Custom Metallic White. Limited Edition Solidbody Electric Guitar, with Mahogany Body, Maple Top, Mahogany Neck with Rosewood Fretboard, 2 x Humbucking Pickups, Special Outfit Collectibles, and White Hard Case. This Limited Edition Signature Les Paul is the culmination of a long-standing relationship between Epiphone and rock legend Tommy "Spaceman" Thayer of KISS. Designed by Tommy from the ground up using traditional Epiphone Les Paul elements, the White Lightning serves up rocking looks and killer licks. Tommy says, "My new White Lightning signature model is the pinnacle of looks, style and flash. I'm proud to put my name on a serious guitar that can be enjoyed at home or rock the biggest stages in the world." Featuring a solid mahogany body with a maple veneer top in a striking metallic white finish and topped off with a chrome pickguard. The Les Paul body has 7-ply pure white and black binding on the top and single-ply pure white binding on the fingerboard, accenting the guitar's iconic silhouette and adding visual punch. The voice of the White Lightning comes courtesy of two Seymour Duncan JB humbuckers, an open-coil at the bridge and a covered one at the neck position, all accented in chrome. To round out what can truly be considered an outfit, the White Lightning comes with a custom white Epiphone hard case, a studded leather strap just like Tommy's original, a certificate of authenticity in a special binder complete with a picture of the legend himself, and a compliment of Epiphone accessories that include the manual, a poster, bumper sticker, and more.